Neuroscientists at the Allen Institute for Brain Science in Seattle have created an atlas of the human brain, which highlights the activity of genes across the entire organ. 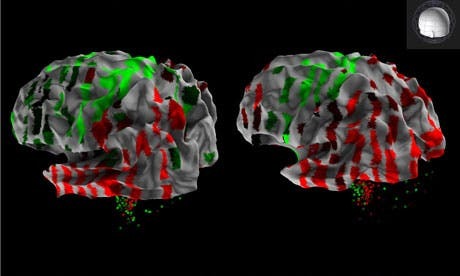 The brain map was created after many hard years of labor, and might help scientists from across the world identify factors that underlie neurological and psychiatric conditions. “The human brain is the most complex structure known to mankind and one of the greatest challenges in modern biology is to understand how it is built and organised,” said Seth Grant, a professor of molecular neuroscience at Edinburgh University who worked on the map. 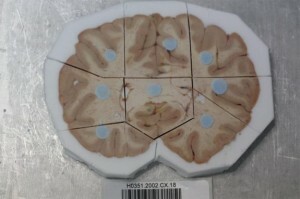 The scientists created high-resolution maps of the genetic activity in the brain, after the studied the brains of two donated, fully integral adult brains and third man’s hemisphere. All of the tissue was healthy upon collection and came from males. With this maps, the researchers can now for the first time overlay the human genome on the human brain, practically bridging the brain and the genome, and thus offering clues as to what genes trigger what functions in the brain. The result is the most complete, most accurate rendering of a human brain we have ever had. To reach their goal, the scientists first performed fMRI scans on the brains to captured the organs in complete 3-D anatomical detail. Then came the tricky part – the brains were chopped into many tiny slices and chemically analyzed genetic activity within about 900 precise areas – this took nine months for each brain. From more than 100 million measurements on brain pieces, with some only a few cubic millimetres, the scientists found that 84% of all genes are turned on in some part of the organ. Are just two and half brains (what a TV show spoof this could’ve turned out to) enough to generalize for any human cortex? Well, the researchers found, when probing the neocortex, which is the center of higher mental function in humans, that gene activity was in principal the same. This extremely similar pattern of gene activity made the researchers suspect there may be a common blueprint for the expression of genes in the human brain; genes which are still sadly oh so poorly understood. Similar genetic maps were constructed for rodents, but held non-conclusive results when attempts to transfer these to humans were made, and thus this project, just recently completed, was first initiated four and a half years ago. Now armed with this new data, researchers hope to make a comparison and see whether brain research on lab animals may or may not reflect the human condition. The atlas, which overlays the genetic results on to a 3D image of the brain, is freely available for researchers to use online, so if you’re planning on researching how a particular gene affects the brain, this might really come in handy. For instance, Clyde Francks at the Max Planck Institute for Psycholinguistics in the Netherlands is already using genetic data from the Allen Institute for Brain Science to pinpoint genes that give rise to brain asymmetries in a set of 1,300 Dutch students. The scientists detail their findings in the Sept. 20 issue of the journal Nature.